The Samsung Galaxy S5 is launching at just the right time in North America to continue a growth trend. Based on web usage data, mobile ad network Chitika says Samsung accounts for 55 percent of web traffic on Android devices in the U.S. and Canada; a jump of 8 percent since the last such study in July 2013. HTC, which is hoping for a hit with its new HTC One later this month, lost 3.5 percent share and Motorola(s goog) followed by losing 2.5 percent of its share since last July. Chitika’s data shows that Samsung doesn’t even have a close rival in North America when it comes to measuring web traffic share. While HTC and Motorola lost ground, Google surprisingly gained it; likely through sales of its Nexus 5 phone and Nexus 7 tablet. The company’s devices account for 2.1 percent more web traffic during the study period although Google devices still lag behind most major competitors; all of which are Google hardware partners save Amazon(s amzn). In terms of device type generating web traffic in the U.S. and Canada, it’s still a smartphone world. Handsets accounted for 78.6 percent of all Android web traffic in the study, while tablets made up the remaining 21.4 percent. As the lines blur between smartphone and tablet, however — phones with 6-inch or larger screens, for example — I anticipate the distinction will lessen in the future. Isn’t Motorola and google the same? Motorola was kept independent from Google on the market as a brand. And it’s going to be part of Lenovo after the sale from Google closes. Good for Samsung. Interesting that no mention is made of Samsung/Android’s actual mobile marketshare in the USA. 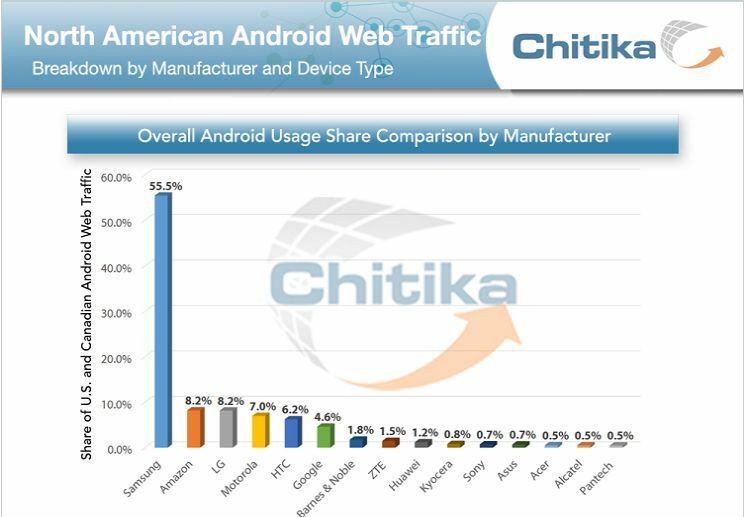 Seems like someone is missing, since Chitika’s reports ( http://chitika.com/insights/2012/six-month-study-ios-vs-android/ ) that Android has only 33% of mobile web traffic. And why is Amazon’s fork off of Android counted in Android numbers? Unless you void Amazon’s warrantee by rooting back to Android, the Kindle can not access Google Play ecosystem.